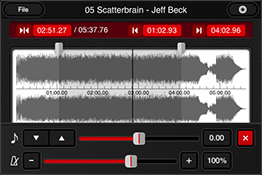 Music player designed especially for musicians.Learn-by-ear has never been easier! The bug was reported that the pro features are not unlocked when you 'sign in' on Ver.1.5.5 using the user account made in Ver.1.5.3. - ‘Sign in’ on the user account screen once. - Tap ‘Delete user account‘. - Tap ‘New user registration‘. Please do registration procedure once again. After delete your user account, you can register by the same user name again. We're preparing a fixed version. As soon as an review of Apple passes, we will release it. Sorry for the inconvinience. *You can confirm the version from ‘Credits&Support of the Setting screen. *It's unrelated to the user who registered before 1.5.2.
mimiCopy is a music player app designed to assist musicians learn-by-ear. 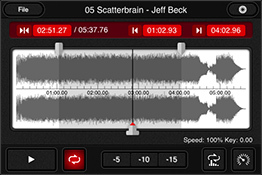 It offers a selection of useful features such as waveform view and playback speed/pitch control. Ideal for slow playback of fast phrases. Select up to three loop positions. You can focus on the intro, hook, and guitar solo, to name a few possibilities, and drill down to those areas for repeat listening. Flexible audio routing settings that let you control which audio channels you listen to. Selectively listen to the right channel, mix both left and right channels while outputting just the right channel to headphones, and more. You can now listen to clips in a much easier manner. Folder playback. You can arrange multiple tracks in playlist format and replay them. This is ideal not only for learning a piece of music, but when studying a subject. Add a text memo to each track. Take down the chord or melody of a song on the spot. 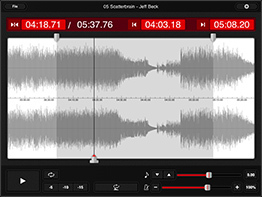 Waveform view for easily skipping to a desired segment or setting a loop. Quick rewind function for going back to replay just the few seconds that you've missed. Supports importing of tracks from your Music library. File import via WiFi or USB. Universal app (supports iPhone, iPod touch, and iPad). Transcribe speeches, interviews, conferences, etc. Enjoy seminars and podcasts at faster (or slower) speed. Some functions above are features of the Pro version. Pro version users must register (registration is free). Compatible with iPhone 4 or later. Support:Use the contact form to get in touch with our support team. Featuring the time stretch engine by P SOFTHOUSE Co.,Ltd. Copyright ©2010 ART Teknika Inc. All rights Reserved.